Titan Merchandise has jumped in the vinyl figure game with their Titans Vinyl Figures and are going strong. They’re 3 inch blind box figures featuring artistic renditions of new and classic properties like Aliens, Ghostbusters, Sherlock, X-Files and today’s set – Doctor Who. There are already several waves, today we are looking at the “Fantastic Collection” which focuses on the 9th Doctor’s reign. There are 16 unique figures with chases, getting them all will require luck of the draw, 2 cases with alternating chases, or some aftermarket hunting. We have 14 of the 16 in hand so let’s take a look after the break courtesy of site sponsor Entertainment Earth! Related Entertainment Earth Links: All Titan Vinyls, All Doctor Who Items, Titan Vinyls Doctor Who Fantastic Case. 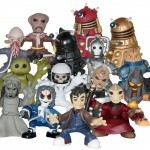 Underground Toys has revealed their new mini figures based on Dr. Who Time Squad. Here are the details.